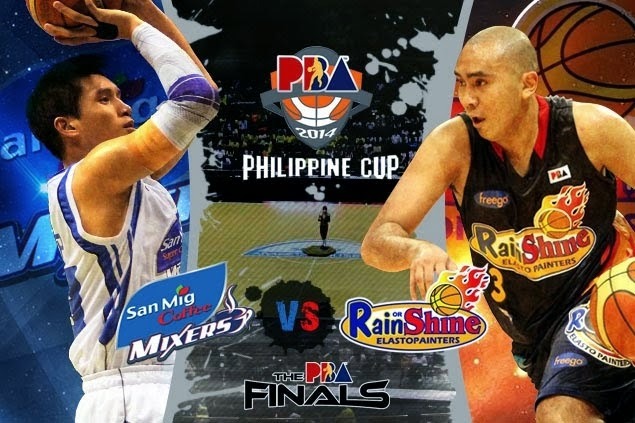 Game 2: Rain or Shine vs. San Mig Coffee Live Updates, Scores - PH Cup Finals 2014 - Balita Boss! Game 2 of the best-of-seven of the 2014 PBA Philippine Cup Finals is underway. Paul Lee tries to give the Rain or Shine Elasto Painters a 2-0 lead over James Yap and the San Mig Super Coffee Mixers. Jeff Chan hits another three but the buzzer sounds. San Mig takes Game 2, 80-70. Belga scores in the post; Reavis hits short jumper. Pinoy Sakuragi Pingris sinks hook shot; Chan quickly answers, drills jumper. Pingris sinks floater and a foul. Last 2 points of RoS courtesy of Ibanez hook shot. Jeff Chan with a long bomb threes. Rafi Reavis drains turnaround fade-away jumper. Teng almost commits flagrant foul. Gerwin Gaco enters the game. Then a double foul from Gaco and Almazan. Sangalang amazing moves, offensive rebound and a putback. Great block from Paul Lee. Nules 1-of-2 from FTs. Belga gets the offensive board and scores putback to beat first period buzzer. Nice fake from Belga then scores off the glass. Yap sinks two free throws, then hits a two pointer. Chan with a jumper that falls. Devance three stretches out Mixers lead to 10 points. About 15 mins til gametime. Who you got for Game 2 of the PBA Finals? San Mig or Rain or Shine? Kampihan na! Greetings, welcome to Balita Boss' live updates for Game 2 of the 2014 PBA Philippine Cup Finals, with the Rain or Shine lead series, 1-0.